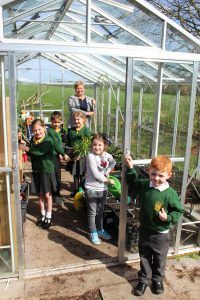 With the Chelsea Flower Show now in full swing, budding horticulturalists at Beoley First School are delighted with their new and much larger greenhouse thanks to local businesses and parents who dug deep for the green fingered project. The pupils received lots of support from a number of local businesses, including Oakland International donating funds to help purchase the greenhouse, Attwell Farm kindly digging and laying the hard-core for the foundations, Total BGS installed the electrics and CET Redditch provided the electrical materials needed. The project was also supported by parents and grandparents who laid slabs and erected the new 18 foot by 10 foot heated greenhouse, which is now being used as part of their year-round outdoor education activities, and was full of healthy plants in time for the children’s space-themed garden which was ‘commended’ at the RHS Malvern Spring Festival.